The aspect of entrepreneurship is very inspiring and many have taken this path to create history and to change the way we live. However, there are many areas where we see gaps and these gaps play a very important role in building the enterprise and making a mark. It can be a commercial organization, not-for-profit or social organization, each start-up has its own way of building up and it has its own life cycle. One day you get this beautiful idea and aspire to make your dream come true. The journey begins here. A journey, which is adventurous and most satisfying. Normally, it is good enough to realize your dreams. But, the commitment to your ideology plays a bigger role. Entrepreneurship is about contribution to the society, rather than thinking it to be a source of extended income. It is tough and it is a penance. Attitude is all what it takes to be an entrepreneur. Entrepreneurship is about living in Risks. If you are a person who does not like taking risks, then you are not set for setting up your own organization. Entrepreneurship is just not about setting up an organization for profit making, but for solving a particular problem – be it commercial or social. Energetic – Need to have energy to face failure. Neutral – Never get carried away, you need to always be on ground to take off. Tough – When the going gets tough, the tough gets going. Romantic – Need to Romance with your Passion. Elaborative – If you cant be straight forward, then the road ahead is bumpy. Passionate – Eat, Sleep, Drink only your thoughts. Researcher – Only when you explore, do you succeed. Empowered – Empower yourself with Passion. Novice – Because, every day is a new day. Enterprising – Because, every day you need to be creative. Understanding – If you cannot understand others, you can never solve their problem. Rich – Attitude, Passion and Commitment to Succeed. If there was no problem / gap in life cycle bothering your mind, you definitely would not have aspired to be an entrepreneur. However, this is not the only reason for you to aspire. 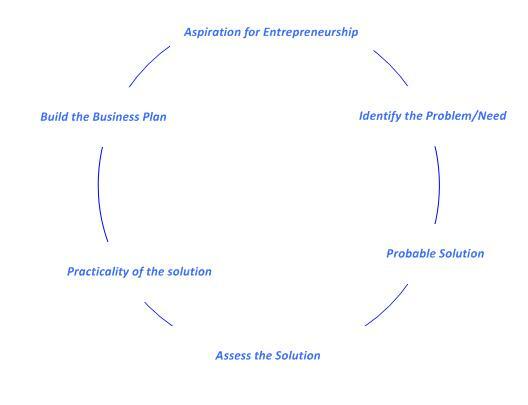 But, in most of the cases, there is a problem / gap in the life cycle which bothers your mind and you want to provide a solution / better solution to solve the problem better / faster / economical / convenient. Think differently to identify the problem. Just because the whole world or people around you are taking about mobile or web, just don’t fix your ideas only in that spectrum. Look around and you will find many areas which need better solutions. My intention of quoting the above is to request you to look around. There are many trivial things which need attention and which people can benefit. When you have identified the problem, you definitely must have given a thought about a probable solution. Lay out and outline your solution. Put it on paper for you to evaluate. The Bottom of Pyramid is one area you would want to concentrate while designing your solution. The concept of BoP elucidates that the need for better and optimized solutions for problems which are frequented by majority of people. Do not aim your solutions at a high level, instead have a humble beginning and make the impact. When you are designing a solution and want your solution to reach the majority, focus on the Pyramid. Identify your potential customers and then plan your solution. This gives your solution a better mileage than what you anticipate. Meet with people, talk about the problem and share your thoughts on how you wish to solve. You might not want to speak to everyone, but definitely speak to your friends / family / mentor’s about your ideas because, without evaluation, it is like jumping into the lake without knowing the parameters of the lake. If you want to make toys, spend a lot of time with children and understand their thought process. Many a times, we think we are providing a better toy, however, when it reaches the child, you might not be able to attract him/her for a long time. If you are building a security system for home’s, speak to as many people as you can and understand the nature of problems they encounter. Example, in villages, there might be a threat with animals coming into homes. In cities, it is just not burglary, but children or domestic help might be at home and parents want to secure few things from them. The list goes on. What I want to iterate here is that spending a lot of time with the end-users will give you a deep dive into their thinking and you will benefit because, when you get to design a solution, it is easily accepted. How practical is your solution? Is it trying to provide Mobile Commerce solutions or search capabilities in the rural areas? You might have the most cutting edge technology, but the target customers are very important. We are not debating if your customers should be based in rural/urban areas, but we are looking at the usage and practicality of the solution. As an example, I can mention the platform ticket vending machine in railway stations which have come up in the recent past. Do you notice one common problem with them? They accept only one rupee coins and five rupee coins. And if you insert a five rupee coin for one ticket, you do not get back the change. What happened? The queue at the counter still remains the same, because many might not carry change always. So, what happened to the innovation, it simply added burden to the organization – the return on investment (RoI) is not met. The most important aspect of realizing your dream is to have your business plan in place. You will need to put it in writing as to how you would accomplish your goal. There are many versions as to how you should write a business plan. I only recommend only one way – write your plan in simple words. Do not use jargons which are very common and a common person might not be able to read/understand. Be Simple, Manageable, Achievable, Result-oriented and Time bound (SMART) while writing. I read some of your article. I am doing research on university entrepreneur in India. Can you help me in this topic by providing with relevant information.